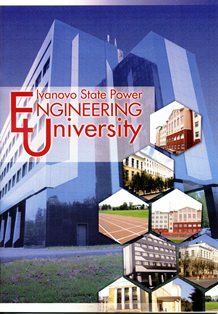 Video presentation "Ivanovo State Power Engineering University - 2011"
Ivanovo Power Engineering Institute was founded on the basis of Ivanovo-Voznesensk Polytechnic Institute in 1930. In 1938 by the decree of the USSR Supreme Soviet Presidium IPEI was named after V. I. Lenin. In 1992 it was conferred a status of university. Today ISPU holds one of the leading positions in the region in terms of quality of education, research, learning facilities and equipment. Overall students staff totals about 7 000 people. 450 professors and lecturers including 57 Doctors and 279 Candidates of Engineering, Science, Economics and Education work for the faculties and research centers. ISPU offers training of specialists, Bachelors and Masters in 44 areas of education in full-time and extra-mural forms of instruction. In addition the university offers post graduate study in 29 specialities and doctorate study in 6 specialities. ISPU offers foreign students full-time and extra- mural education on undergraduate, graduate and post graduate levels. The university includes the following faculties: Heat Engineering Faculty, Electromechanics Faculty, Electical Power Engineering Faculty, IT and Computer Science Faculty, Economics and Management Faculty, Extra Mural Faculty, Faculty of Foreign Students and Teachers Professional Development Faculty. Within its administrative structure the university has a machine-building college. ISPU is active in research. There are 10 large scientific schools, 14 centers dealing with education, research, development and implementation. ISPU scientific achievements have been awarded at the international exhibitions in London, Paris, Hannover, at the world famous Brussels International Exhibitions of Innovation and Geneva Salon of Inventions. ISPU has the best scientific and technical library in Ivanovo region. All library operations from the book order to its delivery to the reader are automated. It is a member of Russian Library Association and a member of two library consortiums – RusLANet and ABRICON. ISPU develops international cooperation with higher educational institutions in France, Germany, the USA, the UK, Israel, Hungary, Poland, Kazakhstan, Lithuania and Tajikistan which implies joint research work, exchange of professors and students, participation in conferences, seminars and exhibitions. ISPU is a partner of European EU4M-Consortium (a two-year European Union Master’s Course in Mechatronic and Micro-mechatronic Systems). In 2005 with the assistance of French Embassy Russian-French Resource Center was established. There you can get information about grants, scholarships, in-company training and study in France as well as take English, French and German language courses. Students, faculty and staff have all the conditions to maintain a healthy life style: Health Center which offers preventive medical examinations and treatment, a sport and health camp on Rubskoye Lake where students and teachers can recreate, university stadiums and gyms to practice 19 kinds of sport. ISPU students take part in national and international competitions and demonstrate outstanding results. Artistically creative students can develop their talents in the theatre of variety miniatures, music bands, dance groups and Student Television Studio. The best of them have repeatedly become winners of regional and All-Russian festivals and contests. ISPU graduates are in great demand on Russian and foreign labor markets. Their professionalism is invariably acknowledged by numerous employers.